Physiotherapists often use manual therapy techniques as a treatment to improve the condition and mobility of the tissues in a painful or injured area. 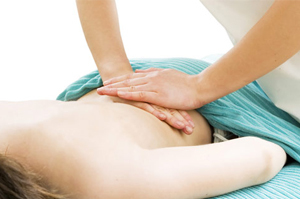 Manual therapy is a specialised form of physical therapy delivered with the hands as opposed to a device or machine. In manual therapy, physiotherapists use their hands to put pressure on muscle tissue and manipulate joints in an attempt to decrease pain caused by muscle spasm, muscle tension and joint dysfunction. It is important to recognise the role of muscles and their attachments around the joints. Muscle tension can often decrease once joint motion is restored, but many times the spasm will continue to be present. In such cases, muscle tension should be addressed or the joint dysfunction may return. Soft tissue massage is essentially manual therapy specifically targeting soft tissues (muscle, tendons, and fascia) and can be used to treat soft tissue abnormalities such as increased muscle tension, trigger points, and abnormal thickening of connective tissue. The soft tissues of our body (muscles, tendons, and fascia) are generally organised in layers that need to slide and glide over one another for movement to occur normally. Lack of this ‘sliding and gliding’ can lead to restriction of movement in a body region, with the development of harmful altered movement patterns to compensate for this restriction. Soft tissue mobilisation (STM) is used to break up inelastic or fibrous muscle tissue (called ‘adhesions’) such as scar tissue, move tissue fluids, and relax muscle tension. This procedure is commonly applied to the musculature surrounding joints, and consists of rhythmic stretching and deep pressure. The therapist will localise the area of greatest tissue restriction through layer-by-layer assessment. Once identified, these restrictions can be mobilized with a wide variety of techniques which help ‘loosen up’ these restrictions, lessening the need for the compensatory movements, while also making retraining of the correct movement patterns more achievable. As well as having an effect on how the body moves, soft tissue abnormalities can also be a primary source of pain. ‘Trigger points’ (muscle knots) are well known to cause pain, and also may adversely affect how a muscle functions. Elimination of these trigger points can significantly reduce pain and additionally may assist rehabilitation of specific muscles. Patients are often diagnosed with a pulled muscle and are advised to treat it with rest, ice and massage. While these techniques feel good initially, the pain often returns because the muscle spasm is in response to a restricted joint. Joint mobilization loosens up the restricted joint and increases its range of motion by providing slow velocity (i.e. speed) and increasing amplitude (i.e. distance of movement) movement directly into the barrier of a joint, moving the actual bone surfaces on each other in ways patients cannot move the joint themselves. These mobilizations should be painless. Muscle energy techniques (MET’S) are designed to mobilize restricted joints and lengthen shortened muscles. This procedure is defined as utilizing a voluntary contraction of the patient’s muscles against a distinctly controlled counterforce applied from the practitioner from a precise position and in a specific direction. Following a 3-5 second contraction, the operator takes the joint to its new barrier where the patient again performs a muscle contraction. This may be repeated two or more times. This technique is considered an active procedure as opposed to a passive procedure where the operator does all the work (such as joint mobilizations). Muscle energy techniques are generally tolerated well by the patient and do not stress the joint. The goal of joint manipulation is to restore the gliding motion of the joint, enabling it to open and close effectively. It is a more aggressive technique than joint mobilizations and muscle energy techniques that involves taking a joint to its restrictive barrier and thrusting it (low amplitude of less the 1/8 inch) to, but not past, its restrictive barrier. If utilised properly, increased mobility and a decrease in muscle tone about the joint should be noticed. This technique is utilised for restoration of joint motion and does not move a joint beyond its anatomical limit. Manual Therapy works best when used in combination with exercise and activity. Your physiotherapist will explain to you what you need to do to help the healing of your tissues between therapy sessions.